Our broiler chicks have graduated from the brooder and are in their own coop tonight!! Our little rooster crowed for the first time today! 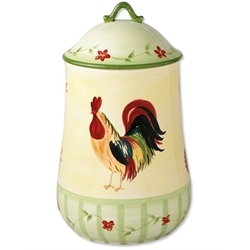 That merits a rooster canister, don't you think? And it would be a great Mother's Day gift for my wife, too! At the risk of sounding greedy, that Pfaltzgraff canister would like great with our new creamer and sugar holder! I'm out of chicken stories. 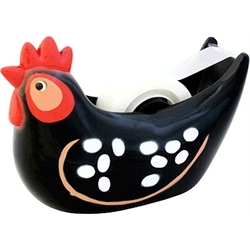 Would be cool for holding my rooster shaped cookies, yes I have a rooster shaped cookie cutter. My hens need a rooster and I need a canister..
Pullets are ranging in the yard and enjoying the worms that the rain has brought out. I can't wait for the sun to begin shining again so my chicks can finally go out into the yard and out from my basement. Our chicks are due to arrive this week!! I don't have any chickens but I support those who raise free-range chickens in a humane environment!